Any player that is lined up a possible high pick in the NBA Draft clearly has a great deal of talent but talent alone is not enough to take a player to the top of the sport. Luck is always going to be a factor and of course, basketball is a team game and the success of a player will often depend on how they click and engage with their team-mates. Of course, there is also a lot to be said for the fact that a player must have confidence and self-belief when it comes to making a positive impact on the NBA. Andrew Wiggins is one top player who may well find himself heading to the NBA this summer and there has been plenty of positive reports on the player. Wiggins is said to be an elite athlete with a defender who is great on the ball. There is clearly room and space for the player to improve, which is what you would expect from a youngster but he does have enough natural talent to take him a long way. While the flaws and doubts in his game have left some people thinking that he shouldn’t be in the running for the first pick but he is a player that many teams will be looking at. I think I’ll be a star wherever I go. That’s just how confident I am in my ability. There are many different factors involved in choosing players and there is no denying that self-confidence is something that many teams are looking out for. Some of the biggest names in basketball have shown that they have the talent and skills to back up their confidence and this is something that often stands a player apart from his peers. While it is still far too early to state that Wiggins is in the class of Jordan or Bryant, there is a line to be taken from these players to the up and coming players of today. 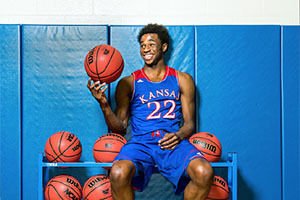 Wiggins is one of the many players who are currently unsure of where they will be picked in the 2014 NBA Draft due to the injury sustained by Joel Embiid. While no one can say for sure what will exactly take place during the NBA Draft, there was a level of expectation that Embiid would be number one. With most teams thinking that Embiid would be too much of a risk, it may be that the Cleveland Cavaliers make the decision to make Wiggins their number one. However, there has been a lot of talk about the level of interest that the 76ers from Philadelphia hold in Wiggins, so they may try and make moves to ensure that they get the player they are becoming increasingly interested in. Confidence is something that can make the difference for basketball players so there is no doubt that Wiggins is right to believe in himself and his talent. Of course, he also needs to back this up when he steps on to the court and this is where the true test of the player and his abilities will be found. With so many changes and great names in the frame, the betting for the 2014 NBA Draft is still wide open. There isn’t much time left before the Draft but with online betting, there is still an opportunity for you to put your money where your mouth is. If you think Wiggins will be the number one pick, or you think someone else from left-field will get the call, be sure to check out the NBA Draft betting options.